Very nice blog as usual! Please allow me to comment on a few things. First, I believe that the terminology and explanation of RPT and SPT isn’t quite right. Following the terminology in RFC 4601, RPT is a Rendezvous Point Tree, and is indeed built from receivers toward an RP so that multicast data can flow from RP down to the receivers. SPT stands for Shortest Path Tree that is, in general, built from receivers toward multicast sources, not just from an RP toward a source. It is true that in ASM, the RP builds an SPT toward the source as a receiver, and then “knits together” the SPT with the RPT, but in this case, RP is posing as an end receiver. In general, SPT is built from receivers toward sources, and in SSM, this is in fact the only tree that exists and is always created directly from receivers (SSM does not need an RP). Second, I believe that it is appropriate to talk about Phantom RP only in cases when the RP address is not really assigned to any interface but merely lies inside an advertised network prefix. Not every RP address in a BiDir PIM is a Phantom RP – if referecing a true router’s interface then that’s not a Phantom RP. Third, I do not fully agree with the statement: “The RP is even more critical in PIM BiDir because all traffic flows through the RP.” To me, it is exactly the opposite. In ASM, the RP actualy did something – it collected (*,*,RP) and (*,G) Joins, received PIM Register messages, created SPT toward their source on their behalf, sent PIM Register-Stop messsages, received PIM Null-Register messages and responded accordingly – there was a bunch of activities exclusive to an RP in ASM. In BiDir, the only thing RP does is to be a reference point – a vector, just as you said. But if it is just a reference point with no active involvement in the traffic path or processing, its criticality is arguably smaller, and especially considering Phantom RP in which the address does not really belong to any router, there is no traffic flowing through the RP – because none really exists, right? If an address from a physical link was used than, true, multicast traffic would flow through this RP Link (RPL). The RPL does not even physically exist when loopback addresses are used as RP addresses. Fourth, the RPF in BiDir PIM is still used to determine the proper interface toward the RPL. Its importance is somewhat downplayed in comparison to ASM/SSM but it is still crucial. Nonetheless, a great blog and overview! Thanks a lot for the comments, Peter! I also changed the statement about the criticality, I guess it can be argued both ways. It’s true as you say, that it has a very limited role. On the other hand without a RP, all traffic would not flow. Or am I missing some concept here? Regarding the traffic flowing through the RP, even if we use a loopback, there must still be physical interfaces on the RP? What am I missing here? 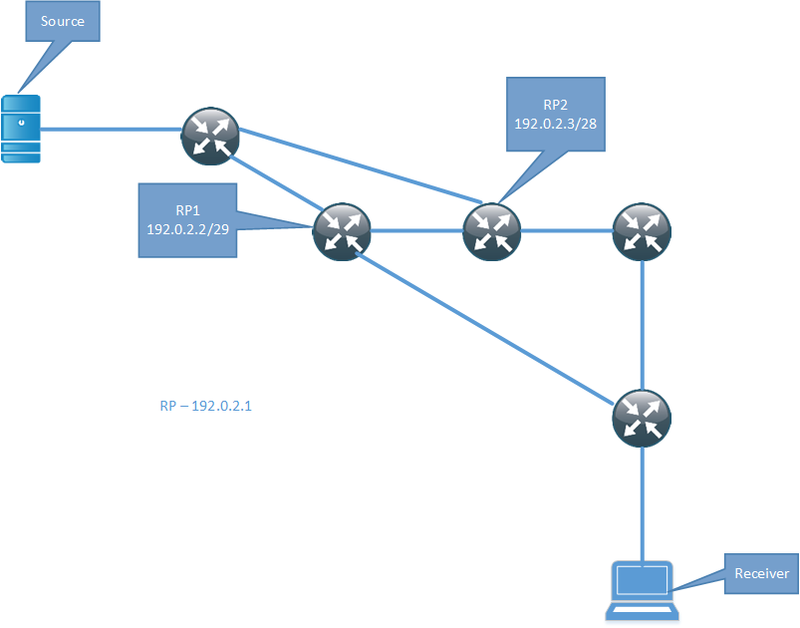 Regarding the criticality of the RP, in both ASM and BiDir, it is imperative that every router in a multicast-enabled network knows who the RP is and how to get to it. BiDir ends here, provided that at least the IP subnet in which the RP is located exists. In ASM, the RP has to actually exist as a network entity and perform all those functions commented earlier. With the traffic flowing through an RP in BiDir PIM, you have designed your network with point-to-point links between routers, so if the RP happens to be placed in the path the multicast has to flow through then by all means, traffic will flow through it. However, think of multi-access networks as well. In the figures you have posted, the RP has its “left” and “right” neighbor (you didn’t label the routers so I cannot refer to them by their names) connected in a point-to-point fashion. 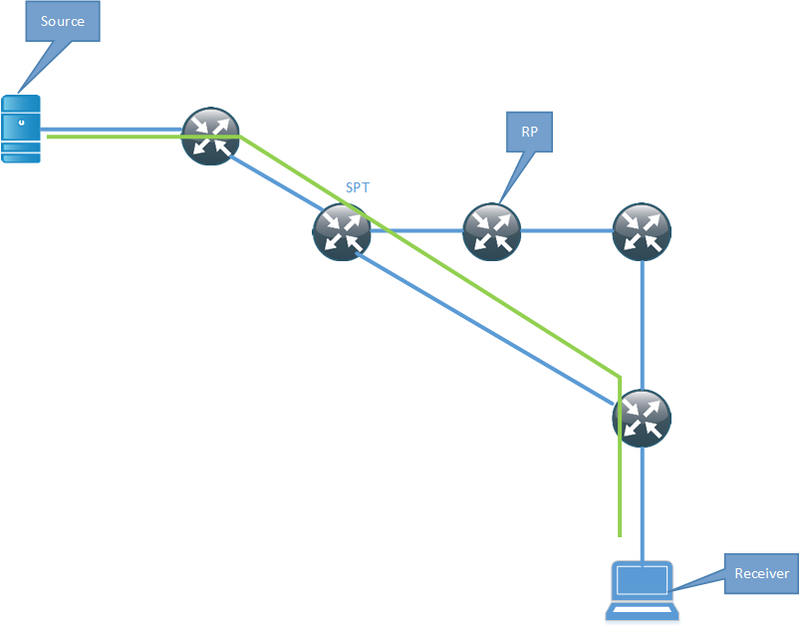 Assume that the “left” and “right” router were connected by a switch, and that the RP was a third router on this common network connecting “left”, RP, and “right”. Would then the multicast flow through the RP? Surely not – it would flow up to the RP but RP would not forward it back, and because there would be no further routers behind RP, it would be silently dropping the multicast without forwarding it anywhere. Just to be exact, even if you created the multi-access segment between “left” and “right” and had the RP connected to it as a third member, this segment would not be considered the RPL unless the RP was identified by the IP address of its physical interface in this common segment. If the RP was identified by the loopback address, the RPL would also be virtual – the imaginary network constituted by the loopback interface.